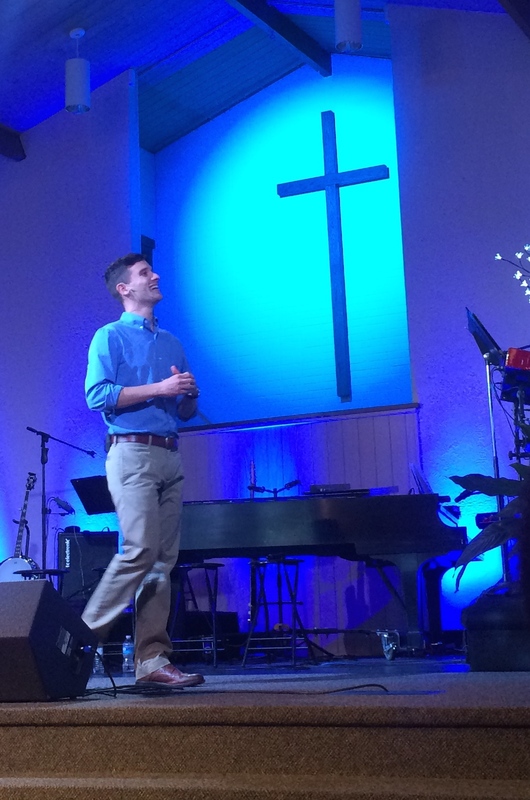 Timmy got to preach at Virginia Beach Community Chapel this Father’s Day. “Raise your hand if you ever taught me in a Sunday school class,” Timmy requests on Sunday morning. I’m sitting in the front row of a fiercely air-conditioned sanctuary, shivering while outside the temperature climbs to 90˚ F before 9:00 AM. I’m not in Germany anymore. Where I am is Virginia Beach Community Chapel, Timmy’s home church since he was ten. It holds a special place in his heart and his story, a similar place that Bethany Community holds in mine. Today–Father’s Day–he is giving the sermon, a call to missional living lived out within the context of family and hospitality. I turn around to see a forest of hands waving back, a multitude of men and women who have invested in my husband’s life. It’s a powerful moment, more than a mere illustration of his point, that living missionally isn’t tied the going overseas, evangelizing or church planting that we associate with the title of “missionary.” Looking at those hands, I’m reminded of the adage that “it takes a village” to raise a child. Aside from the fact that we’re preparing to raise a child, eventually in a literal village, this phrase has proven as true in my life as it has in Timmy’s. Even in relatively isolated parts of rural Washington–San Juan Island and the Upper Skagit Valley–my childhood was a collage of friends and mentors, people who taught me not just German words and how to play t-ball, but what it meant to love and know Jesus. My years in Seattle were deep and rich with such relationship, mostly at Bethany Community Church, where I found Christlike models of adulthood at every step, with their hospitality and time investment guiding me towards living out my faith in a way both personal and connected to our community. I’ve had many villages. Timmy’s sermon reminds me that even titled missionaries like myself need to remember to be missional. My heart, my mind and my front door need to be open to the young people who fill my days, as I walk a few steps ahead of them on the journey of faith that they’re choosing, or trying to choose. As I’ve written about countless times, these last five years have turned out to be about much more than teaching. They’ve been about becoming part of a village, and in turn helping to invest love and life into the young people around me. For now, though, it’s time to revisit our own villages. It’s truly a gift to spend these weeks in the East, visiting the places and people who have made my husband the incredible man that he is. And I’m excited to arrive in Seattle in mid-July, and Skagit County in September, eager to engage with gratitude in the communities that have spurred me onward in this journey. I too would love a Toni hug! We’ll have to arrange that when I’m back in Seattle next month. A walk around Greenlake or a coffee is definitely in order!